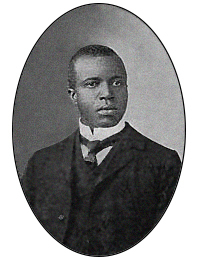 Scott Joplin was an American ragtime musician and composer. He is widely considered the greatest ragtime composer of all time. Joplin was born in the U.S. state of Texas sometime between June 1867 and January 1868 and grew up in Texarkana, Texas. Even though he was from Texas, most of his pieces were written when he was in Missouri and New York City. Joplin is most well known for writing piano pieces called rags. His music became popular again in the 1970s, with the album Scott Joplin: Piano Rags, performed by Joshua Rifkin, from Nonesuch Records. He may be most commonly known now by the Marvin Hamlisch adaptation of his composition The Entertainer (1902) which was used in the 1973 movie The Sting starring Paul Newman and Robert Redford. His best-known song while he was alive was Maple Leaf Rag (1899). Other rags he wrote were The Ragtime Dance (1906) and Magnetic Rag (1914). Scott Joplin wrote more than 40 piano rags, but he also wrote two operas; A Guest of Honor and Treemonisha. A Guest of Honor was performed in Joplin's lifetime, but since then the music has been lost. Treemonisha was never performed while Joplin was alive, but it has been performed since then. Joplin also wrote a symphony, but the music has been lost. Joplin died of syphilis in New York City on April 1, 1917. This page was last changed on 10 April 2019, at 21:21.